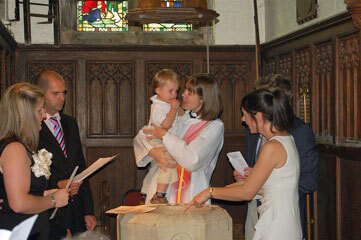 At St Augustine’s Church we are delighted to offer baptism services for babies, children, or adults, as appropriate. 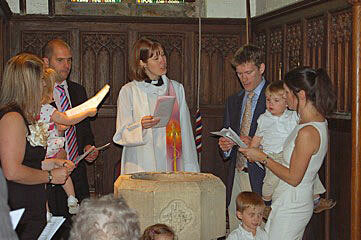 Baptism marks an exciting beginning in a person’s journey of faith, and is always a chance for celebrations. Before this, we invite candidates / their parents to embark on some thoughtful consideration of what it means to be baptised into the Christian faith and the promises that will be made. Come along to a couple of our services, so that you can get to know our church family. This is important because at a baptism service, parents and godparents promise that they will help the child to grow up within the church family, so you need to have met us, and got to know us a bit, in order to make these promises! The best services for you to visit would be our 10am Parish Communion service each week, or our Family Fun Church service, which takes place once a month. There are more details about these services on the services page of the website. Having visited our church a couple of times, contact the Priest, Revd Lisa Barnett, in order to arrange a meeting to talk about what baptism means, and what happens during a baptism service. This is an opportunity to think seriously about the baptismal promises, and to ensure that you and the godparents feel able to make them. Some families decide at this stage to have a thanksgiving service for their child, which enables the family to come to church to give thanks for the child, without having to make promises which they are unsure about. If, having visited our church and met with Revd Lisa, you then decide to go ahead with a baptism for your child, the third step is to agree a date with Revd Lisa, in consultation with your family and friends. Baptisms for babies usually take place during our 10am morning service, or occasionally as a private service at 11.30am. Baptisms of children can also happen during our monthly Family Fun Church. To request a christening at St. Augustine’s, you can either download the Microsoft Word document, which can also be read with a number of other word-processing packages, such as Open Office or Libre Office, or the portable document format baptism request form, which, if it does not open in your web browser, can be downloaded and read using a number of freely available applications, such as Adobe Reader. This page was last edited on Wednesday 17th October 2018 at 23:08:44 GMT, and was last fetched from the server, which is running FreeBSD 11.2-RELEASE-p9, on Friday 26th April 2019 at 00:44:21 GMT.